Gently break up the cheese using your fingers or a mixer. They will resemble coarse crumbs. Heat oil in a pan and add the Cumin seeds. When it splutters, add the chopped onions and fry till the onions become translucent and soft. Add the chopped chillies, tomatotes and coriander and fry for another min. Add the Red Chilli Powder, Turmeric, salt and cumin powder and mix well. Cook till the tomatoes are tender and become pulpy. Add 1 tsp of sugar ( to equalize the sour taste of tomatoes) and 1/4 cup of water and cook for another 2-3 mins. Now add the crumbled cheese and mix well. Cook on high flame for 2-3 mins and serve hot. Instead of using 100% cheese, I have also made this dish using a combination of cheese and tofu. I used 200gm Cottage Cheese and 300 gms Tofu. That taste was exactly the same ! 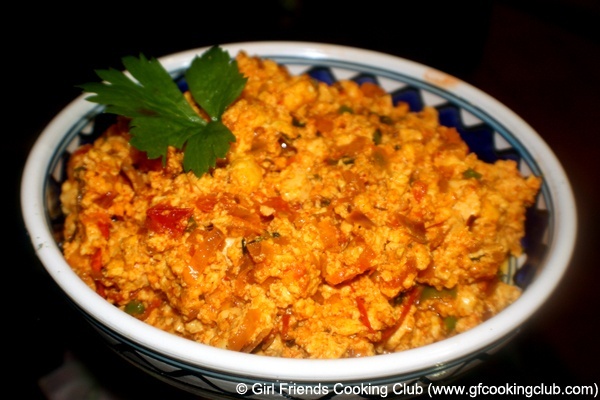 I had some left over Paneer Bhurji and Rotis from dinner and I used it to make a tasty snack. 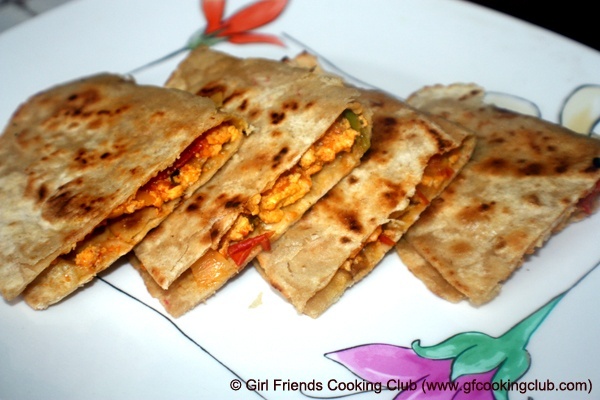 Just fold the Roti in half, stuff some Paneer Bhurji inside it, heat 1 tsp of Oil in a pan and place the stuffed Roti in the pan and lightly pan fry it on both side so that it become crisp. Serve it with sauce of your choice. This entry was posted in All Recipes, Paneer/Cottage Cheese, Tofu and tagged Paneer Bhujri by Kamakshi. Bookmark the permalink.